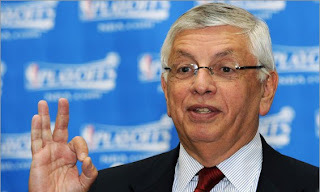 TwoOhSix.com: The NBA Gets it Right! 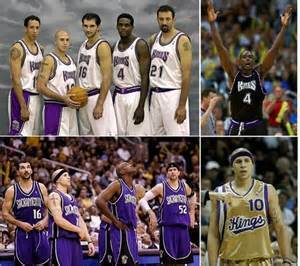 We would not be hailing the return of Kemp, Payton, Schrempf, Sikma, and all the rest, we would be welcoming the likes of Weber, Divac, Stojakovic, and Bibby and all of their history to our city. Sure, the name and colors would be changed so it would look like the Sonics are here, but its simply not the same franchise. I know there are a lot of people that would justify the move by saying we were screwed over so that makes it okay to take another city's team. Right, have fun with that. My preference would be, if we do have to have the NBA here in Seattle which I honestly could really care less about, then we should wait our turn at getting an expansion team after the current TV contract expires in 2015. there's already been talk of it and there's no way we wouldn't be first in line. And no, David Stern doesn't have it out for Seattle, he just sees the bigger picture compared to all the jaded and angry Sonics fans. What ultimately happened is that the NBA used the Seattle group as leverage against the city of Sacramento to obtain a new arena and new local ownership for their franchise. This was basically a power play that has been used time and time again. Los Angeles is constantly used by the NFL as leverage to get what they want from their team's cities just as Florida was used back in the day by MLB. 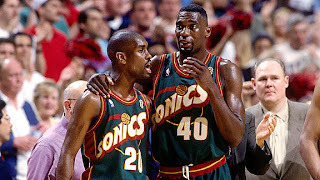 Sure, we'll have a team again some day, but please stop saying we are getting the Sonics back. 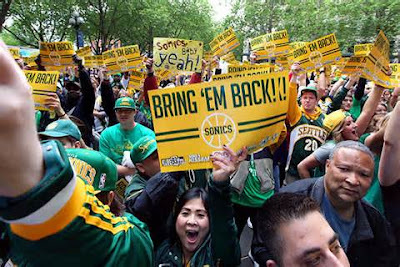 Unless Clay Bennett decides he doesn't want them any more and ships the Thunder back to Seattle it's never going to happen. When a new expansion team does get set up here, we should be happy with a fresh start and ready to move forward, not mad at what was supposedly done to us, or looking back longingly at a franchise that is no longer here. Until then...Go Hawks!